Figure 15. 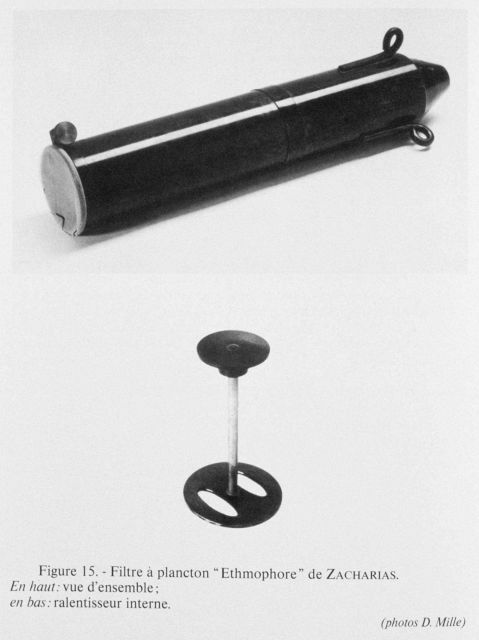 Zacharias ethmophore plankton filter devised by Otto Zacharias in 1907. Top: view of the assembled apparatus. Bottom: internal speed reduction valve. This instrument was devised to collect plankton under adverse meteorolog ical conditions where normal net-towing operations became impossible. This inst rument was first used in a lake, but then in the Mediterranean and Tyrhennian.